Felt flowers are so fun and easy to make. 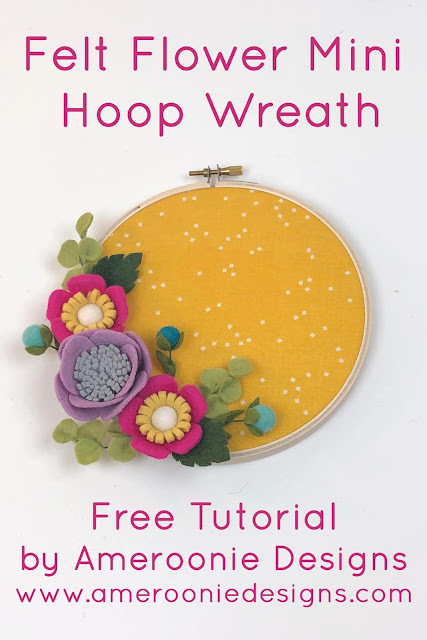 This free pattern provides the pieces needed for all of the flowers in the Mini Hoop Wreath. 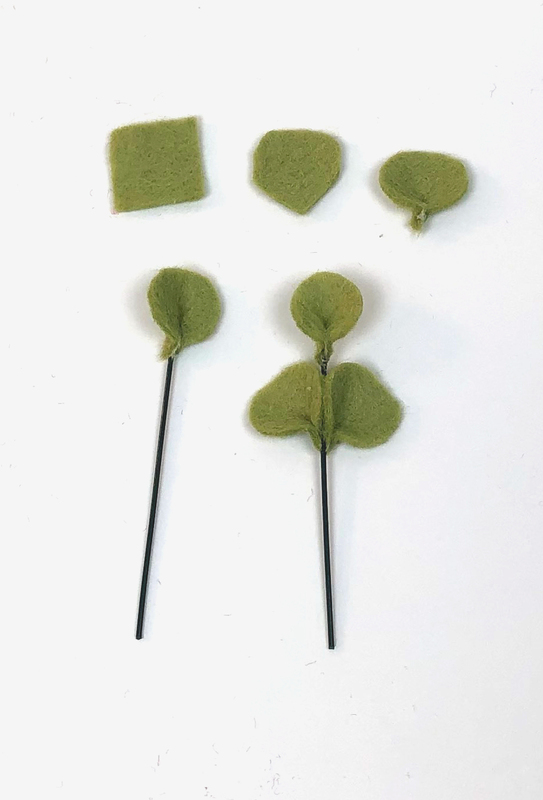 The tutorial in this post will help you make the simple 5 petal flower and round leaf filler greenery. 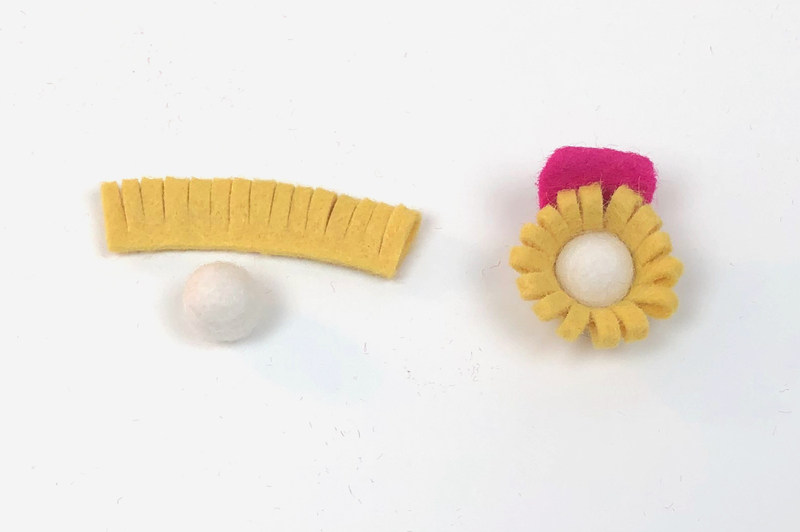 This tutorial will walk you through the assembly of the fringe center felt flower and the Mini Pom Flower tutorial can be found on my IG highlights. 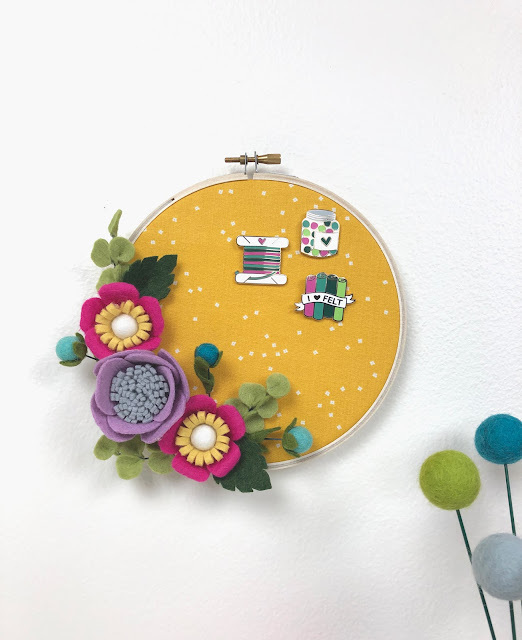 I also have video tutorials for both the fringe center flower as well as the Mini Pom flowers on my YouTube channel. 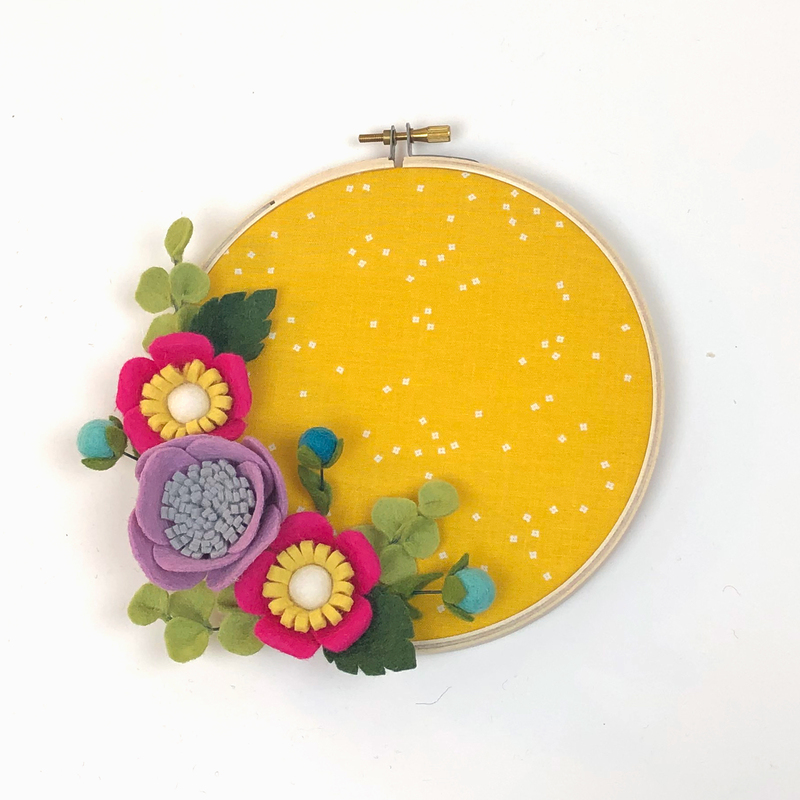 All of these flowers combined yield a fun mini embroidery hoop wreath that can be used for decor, holding your enamel pins or as an accent in a gallery wall. Cut the slit in the bottom of the petals, remove paper. Place a small dot of hot glue on one side of the slit. Cross over the second side of the slit to create a dart in the petal, I prefer to make a sharp dart and so I cross over the slit as far as I can, making a 90* angle on the bottom. Roll the top of the petal towards the back of the petal- you may need to wet your fingers slightly to get it to roll. Continue to roll it until it holds the shape you like. Fold the center fringe piece in half and glue along the long side. Cut fringe along the folded edge of the strip. Place a dot of glue on the bottom cupped portion of your petal and place on the flower center. The top of the petal should be approximately in line with the top of the fringe. Continue placing petals around the flower center, the petals should only slightly overlap. 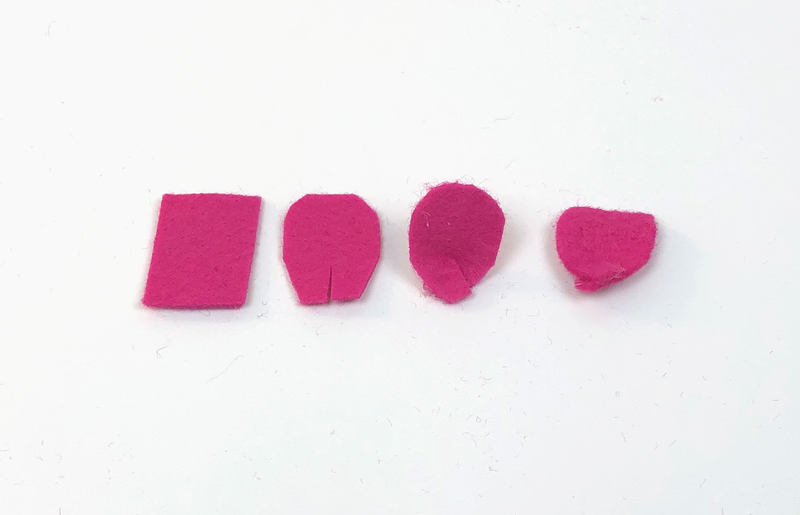 Follow instructions for cutting felt pieces out using freezer paper. Take one leaf and a piece of wire 1 1/2" or 2" long, place a dot of glue on the bottom point of the leaf and pinch around the top of the wire piece. Take two leaves, place a small dot of glue on the bottom point of one leaf, use the second leaf to pull off some of the glue from the first leaf- this will keep the glue from oozing out of the pinch in the leaves. Pinch the leaves in half at the bottom. Place a small dot of glue on one side of a leaf where it's pinched at the bottom, place on the wire. Use a second leaf to sandwich the wire- add more glue if needed to the second leaf. Repeat steps 3 and 4 for a second set of leaves. Repeat steps 1-5 for the remaining 2 sets of leaves. These wreaths look so cute holding all of your flair and enamel pins! 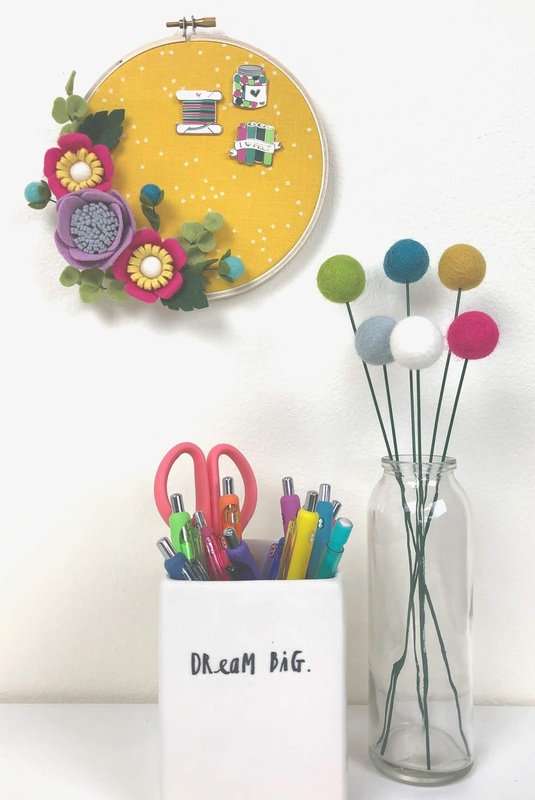 They would be fantastic above a desk, in a gallery wall or stand alone decor in your room! I hope you enjoy making them! They are a fun, satisfying afternoon project! The fabric for this post was provided by Riley Blake Designs to allow my participation in the blog tour, the project and opinions are all my own. I love giving useful, handmade gifts whenever I can. 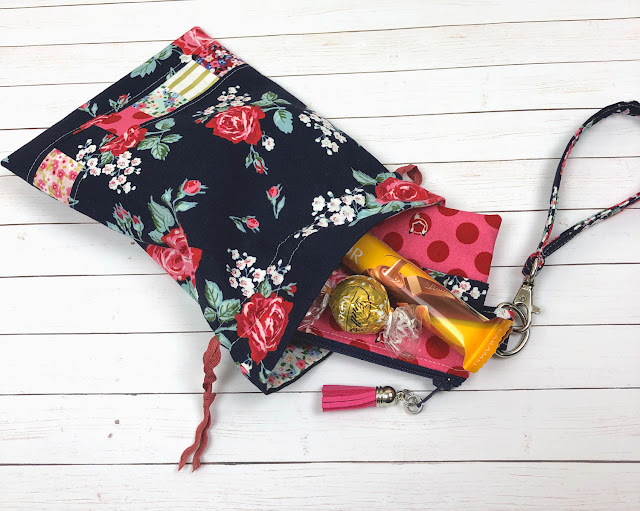 These lined drawstring pouches and mini ruffle pouches are often a go to for me. 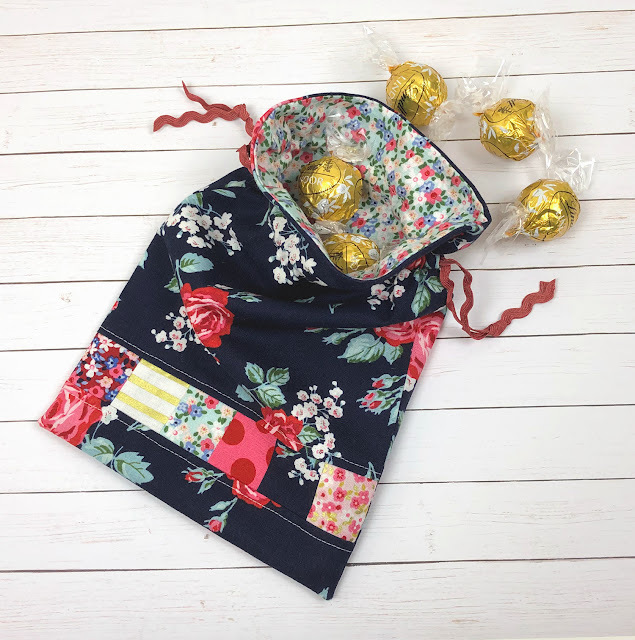 It is so easy to add a gift card and maybe some delicious chocolates and you have a unique, thoughtful gift anyone would love. 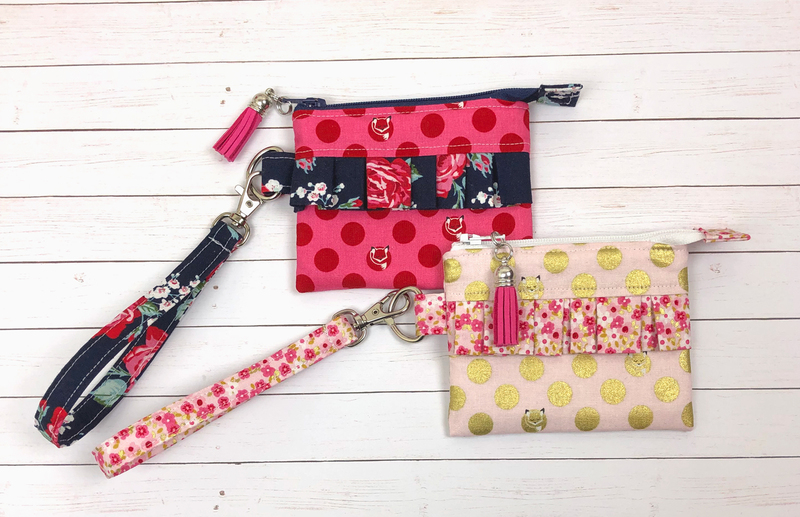 When I saw these gorgeous floral prints in the Fox Farm fabric line- I just knew they would make amazing pouches and boy, I was right! There are so many great prints in this line. The gold sparkle Melissa almost always includes in her lines is absolutely stunning in this line- I think the mini pink floral with gold flecks might be my favorite print, but it would be really hard to choose. 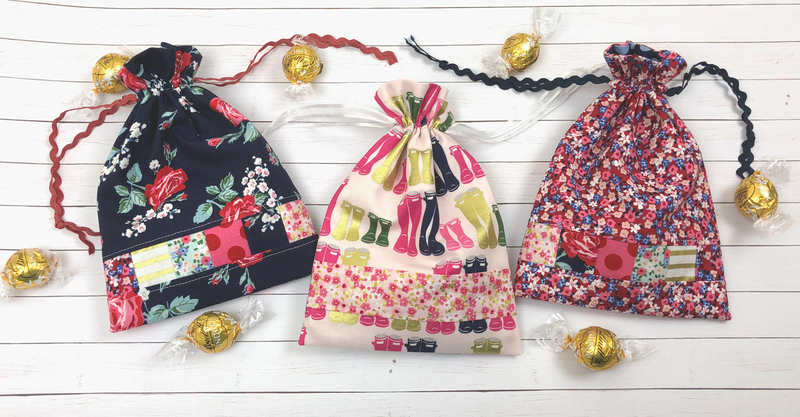 These drawstring pouches are easy to sew up in batches so make a bunch to have on hand- Mother's day, Easter and Teacher Appreciation are coming up right around the corner and these would be fantastic for any of those occasions! 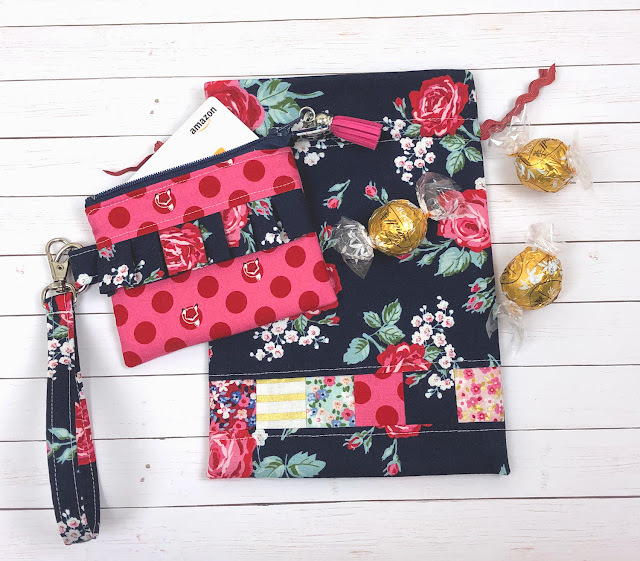 Or combine it with a mini zipper pouch and step your gifting game up a notch! A mini ruffle zipper pouch is also a great gift all on its own. 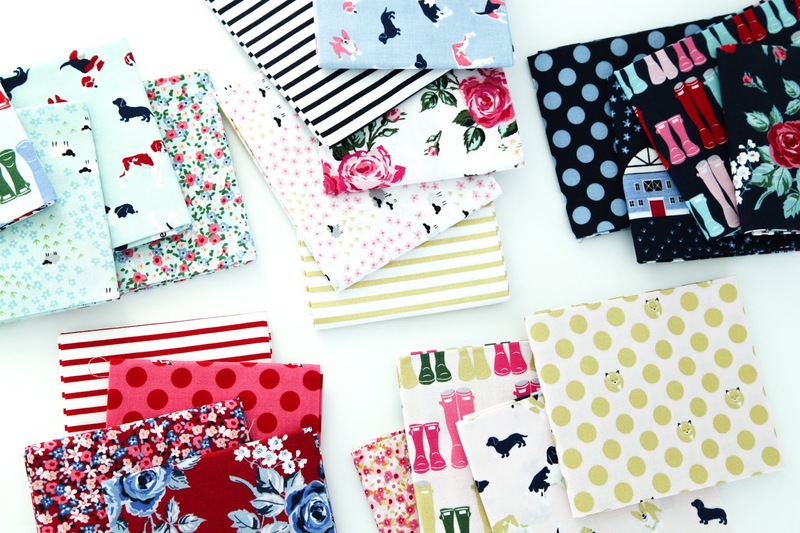 Don't you love the little foxes in the polka dots? Such fun details in this fabric! I'm so glad I had the chance to play with this lovely fabric! The colors are beautiful and the florals are lovely and I am sure I will be sewing with them much more in the future. 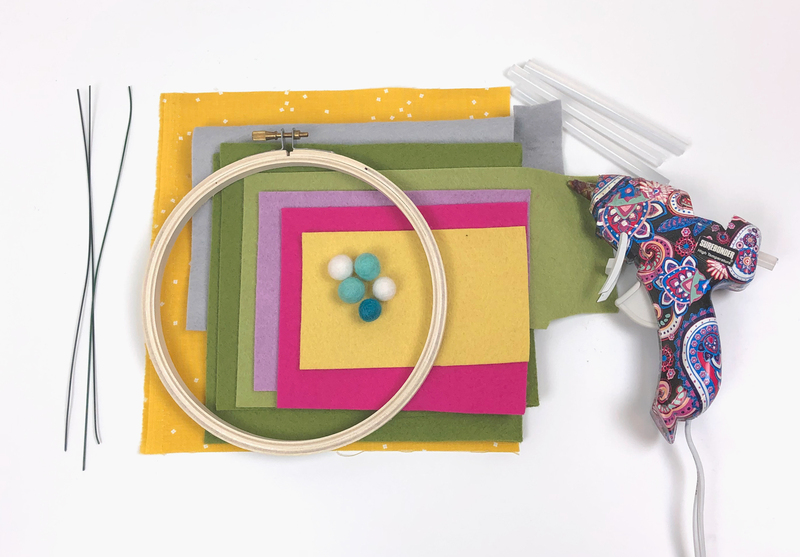 What will you sew with it? It will be available any day now in stores, so keep your eyes peeled! 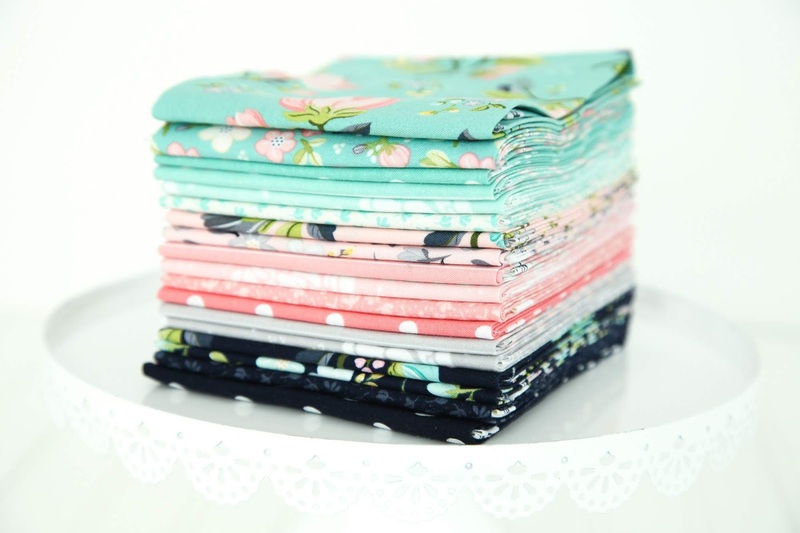 Adding touches of spring around my house always gives me so much joy- especially when they include fabrics like this Serenade fabric from Riley Blake Designs. The navy is such a fantastic background for all of the other colors- allowing them to really pop. 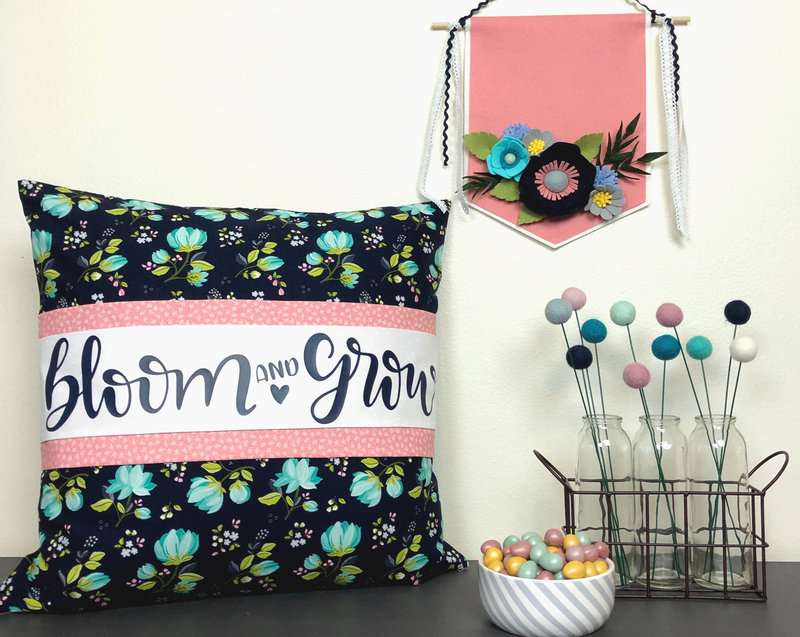 I was sent some fabric from Riley Blake to sew up a pillow as part of the blog tour celebrating this gorgeous fabric line! 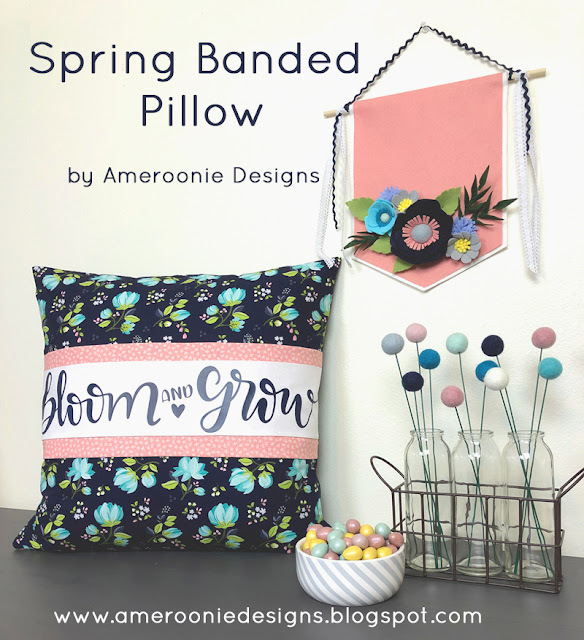 This pillow features a raised band that won't move or shift on you giving you the look of a banded pillow, without the headache of constant adjusting! Using heat transfer vinyl allows you to add a quote or image to your pillow easily, or just use a third fabric to create a contrasting band. You can find all of the directions for putting together your own faux banded pillow in this post on my blog. It's a quick project that can add a lot of impact! If you make one, I'd love for you to tag me on Instagram @AmeroonieDesigns. 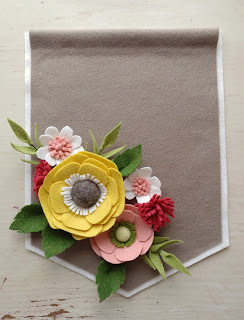 And, if you are interested in the felt flower banner- the pattern for all of the flowers and the banner itself is available in my Etsy shop.